CAMBRIDGE, Mass. -- Why did language evolve? While the answer might seem obvious — as a way for individuals to exchange information — linguists and other students of communication have debated this question for years. Many prominent linguists, including MIT’s Noam Chomsky, have argued that language is, in fact, poorly designed for communication. Such a use, they say, is merely a byproduct of a system that probably evolved for other reasons — perhaps for structuring our own private thoughts. Ambiguity is different from being vague. Vagueness is not being specific in communication whether by withholding information or not being precise on the delivery of the message. 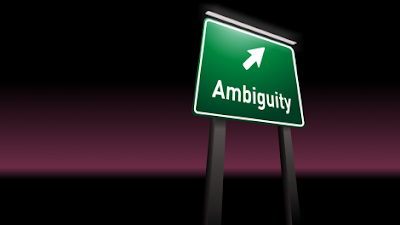 Ambiguity is relaying communication that may be interpreted in more ways than one. Ambiguity relies on the context of how the message is said or written down. As evidence, these linguists point to the existence of ambiguity: In a system optimized for conveying information between a speaker and a listener, they argue, each word would have just one meaning, eliminating any chance of confusion or misunderstanding. Now, a group of MIT cognitive scientists has turned this idea on its head. In a new theory, they claim that ambiguity actually makes language more efficient, by allowing for the reuse of short, efficient sounds that listeners can easily disambiguate with the help of context. Lead author of the paper is Steven Piantadosi PhD ’11; Harry Tily, a postdoc in the Department of Brain and Cognitive Sciences, is another co-author. For a somewhat ironic example of ambiguity, consider the word “mean.” It can mean, of course, to indicate or signify, but it can also refer to an intention or purpose (“I meant to go to the store”); something offensive or nasty; or the mathematical average of a set of numbers. Adding an ‘s’ introduces even more potential definitions: an instrument or method (“a means to an end”), or financial resources (“to live within one’s means”). But virtually no speaker of English gets confused when he or she hears the word “mean.” That’s because the different senses of the word occur in such different contexts as to allow listeners to infer its meaning nearly automatically. Context refers to the accompanying (and surrounding) words and ideas of the message. This points out how the expression (in this case, the ambiguous expression) should be understood as a whole. To test this prediction, Piantadosi, Tily and Gibson carried out corpus studies of English, Dutch and German. (In linguistics, a corpus is a large body of samples of language as it is used naturally, which can be used to search for word frequencies or patterns.) By comparing certain properties of words to their numbers of meanings, the researchers confirmed their suspicion that shorter, more frequent words, as well as those that conform to the language’s typical sound patterns, are most likely to be ambiguous — trends that were statistically significant in all three languages. To understand why ambiguity makes a language more efficient rather than less so, think about the competing desires of the speaker and the listener. The speaker is interested in conveying as much as possible with the fewest possible words, while the listener is aiming to get a complete and specific understanding of what the speaker is trying to say. But as the researchers write, it is “cognitively cheaper” to have the listener infer certain things from the context than to have the speaker spend time on longer and more complicated utterances. The result is a system that skews toward ambiguity, reusing the “easiest” words. Once context is considered, it’s clear that “ambiguity is actually something you would want in the communication system,” Piantadosi says. The researchers say the statistical nature of their paper reflects a trend in the field of linguistics, which is coming to rely more heavily on information theory and quantitative methods. “The influence of computer science in linguistics right now is very high,” Gibson says, adding that natural language processing (NLP) is a major goal of those operating at the intersection of the two fields. But, as Gibson says, computer scientists have long been aware of this problem. The new study provides a better theoretical and evolutionary explanation of why ambiguity exists, but the same message holds: “Basically, if you have any human language in your input or output, you are stuck with needing context to disambiguate,” he says.